In an arena overlooking the shipyard that built the Titanic, Great Britain ensured that its World Championship heartache would go on no longer. A crushing 4-0 victory over Japan earned gold for the host nation and secured promotion to Division IA after four seasons. For many of the players it was a case of third time lucky. In Eindhoven in 2015, and again in Zagreb 12 months ago, Britain had been within minutes of promotion only to fall at the final hurdle. This time, there was no mistake. Aided by a couple of early GB penalties, Japan took the early initiative and home hearts were in mouths as a shot dinged off Ben Bowns’ post. But the Japanese suffered a big blow midway through the opening stanza when Hiroki Ueno limped out of the game after taking a hit in front of the benches. Ueno, part of Japan’s free-scoring first line, was replaced by Masahito Nishiwaki, but some of the chemistry that had powered the team’s speedy offence was diluted and Britain began to take control of the game. The breakthrough came late in the first period as Japan ran into penalty trouble of its own. 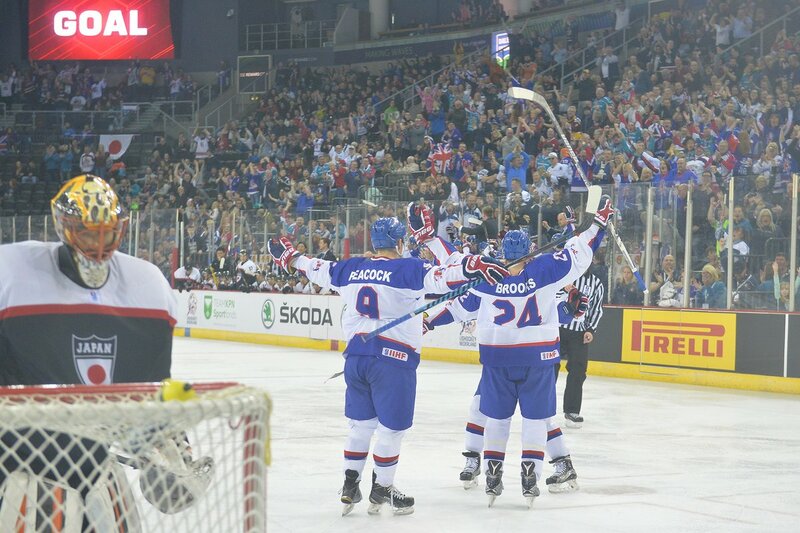 GB earned a 5-on-3 advantage and Robert Dowd cashed in with the opening goal. Ben O’Connor saw a slap shot come back to him and passed to Robert Farmer on the goal line. Farmer then picked out Dowd in front of the net and the Sheffield Steeler sent the crowd into raptures with his fourth goal of the tournament. And Dowd was involved again as the host nation doubled its lead on another power play in the 25th minute. His shot from the top of the circle took a touch from Brendan Brooks and went through the five-hole. Japan thought it had a lifeline in the 28th minute when Kenta Takagi put the puck in the net, only for the on-ice officials to call no goal because the net was off its moorings. After a long look at the video, that verdict was upheld, much to Takagi’s disgust. Seconds later, Japan trailed by three. Colin Shields, one of the heroes of the tournament for GB, fired in a shot from the point and Matt Myers threw up a huge screen to redirect the puck beyond Fukufuji. The Belfast crowd, which included Rod Stewart, in town to watch his son Liam, went wild. Then Myers grabbed his second of the night, finishing off an odd-man rush after a superb David Phillips pass sent Evan Mosey off to the races. With a 4-0 lead, the home crowd started the party 20 minutes ahead of schedule. That confidence was justified. Japan struggled to get its pacey offence into the game, managing just 10 shots on goal through 40 minutes, an astonishing turnaround from the devastating attacking play Takahito Suzuki’s team had produced in its first four games. The loss of Ueno clearly hurt the Japanese, but the home defence deserves credit for the way it denied the opposition the chance to turn over the puck as freely as it had in previous games. Aside from a spell early in the third period, Britain kept Japan at arm’s length, and when called upon Bowns was alert between the piping to deny Makuru Furuhashi on a power play chance or kick away a dangerous effort from Takagi. The Cardiff Devils goalie made 20 saves for a well-deserved shut-out as Belfast got ready for a party that will run right through the holiday weekend. Portugal is not known for ice hockey, they don’t have a rink but they do have a national team and in a effort to be more visible Portugal for the first time enter a international tournament in Grenada, Spain playing against amateur club sides from Spain and Finland . Portugal is coached by Jim Aldred a former IHL & AHL player and the team is made up of players of all ages. Portugal finished in 7th, place in a 8 team tournament and at times really struggled on the big ice losing 8-1 and 9-0 but there was a bright spot when they beat Eagles Granada 5-0 for there only win and the teams first ever shutout. The appetite for Ice hockey and winter sports is there but what is really need is an ice rink in the country and for these players they won’t stop until that goal is accomplished.